Are we going ‘Social Anything’ by putting lipstick on a pig? | Welcome to the Real World! Home › Adaptive Case Management › Are we going ‘Social Anything’ by putting lipstick on a pig? Are we going ‘Social Anything’ by putting lipstick on a pig? Not so long ago it was named Enterprise 2.0 by Andrew McAfee. A lot of functionality is available today as standalone messaging, blogging, wikis, and video servers, or Rich Internet Applications for business use. Then various vendors began to move these functionalities INTO their products to make use of these as enhancers of existing fairly rigid capabilities. Recently the term ‘Activity Streams’ appeared. Mike Fauscette, one of the brilliant minds at IDC, wrote a post that ponders what they could mean for the enterprise. In short, Activity Streams could become the new umbrella layer on top of all the existing silos and merge all their functionalities into a common user experience. Mike Fauscette mentions the product SocialCast that offers such a capability. I have looked at it and while all this sounds very intriguing, it is in principle Facebook Enterprise with a dose of Twitter and looks like the recently demised Google Wave. The Reach component integrates somehow into existing applications and allows their users to collaborate as well. I couldn’t find how the non-intrusive, simple integration the website promises would work. There is an API and for other systems there are existing links such as for Sharepoint. If you know more, please comment. Let’s assume that it is that easy, what then? What does the link to the application actually expose? When and how will the collaborative part provide benefits? Mike Fauscette properly questions who, where and why people in organizations would adopt it and leave the well known GUIs they work with each day. What about apps that aren’t portal-based? Open collaboration for everyone about everything is not a typical business need. If you now add business or HR data and customer information into the mix, data security and process guidance becomes a huge issue. There is a definite need for more than the silos, because take away email and Office tools and business will be at a standstill. Email already creates today a substantial communication mess that we will need to get under control. Any form of ‘Social Media’ will be worse. If simple collaboration would be the solution then Lotus Notes would be pervasive today. We are however looking for a reliable way to provide value to the customer and that has to follow the strategic objectives and operational targets translated to process goals. 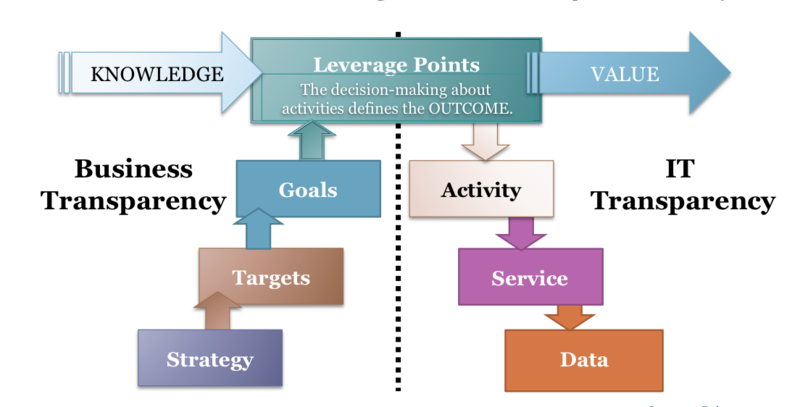 The knowledge worker decides at ‘leverage points,’ which activities linked to IT services will achieve the goals defined in the process. While I can imagine that Activity Streams can link to the apps, I fail to see how they guide, regulate and where needed enforce. A 'Leverage Point' turns knowledge into value. Is Social the Future of BPM? Some propose that Activity Streams might be the future of BPM. I would see them as completely opposite solutions on the process spectrum. BPM structures everything and needs SOA, while Activity Streams break down the structures and grab the GUI. Don’t get my scepticism wrong. Social is appealing to me because it is aligned with my picture of the complex adaptive system that any business is. But after all it is a system and that implies some structure, and it implies that the structure exists because its members follow a common interest that is broken down into individual goals in a hierarchy of work divisions and expertize. Activity Streams sound like empowerment, but they really aren’t. There is no authority, no goals and no means. Activity Streams are like a phone system where all phones are off the hook. To make phones more manageable voicemail was invented to make it less disruptive and asynchronous. Email works because I chose when to deal with it. To try and organize my workday from a stream of tweets sound like a recipe for madness. Let’s face it: Social Anything is a hype. Some even call Facebook the most effective destruction of productive time. If Activity Streams are too dynamic, maybe Social BPM is the answer? Which kind of Social BPM are we talking about? The one where people collaborate to design processes or the one where at certain points of a process a social collaboration can be performed? And what does that do to COE process governance that is after all the core feature of process maturity? Design-time Social BPM does either break the governance process or it emphasizes governance bureucracy. Here is the crux: If you need design-time Social BPM then your process creation is too complex for business. If you need to collaborate with an expert to do BPMN or to add coding, you better make it a project. So what about run-time Social-BPM? Who decides at which point people can collaborate? Or can they collaborate at all times? No matter which, collaboration must either be for information gathering or work delegation. Information gathering might be asynchronous, meaning that the information provider may not have it readily available. How do you inform that person about all the information that he might need to provide information on? Do you paste it into the message? And then when you get the information, is it in the text of a message? Where is the benefit over email? Maybe the tools help with that but it might seriously endanger data security. If you delegate work how do you know about it’s completion? To link by text into apps we would go back to ONE-LINE command streams that for example the old airline systems use. How long does an agent check-in take compared to the Web? Sorry, I don’t see the point of messaging within a rigid process at all. The other reason to gather information is for decision-making that will influence the course of the process. But decisions are pre-coded in gateways. So clearly, in-process collaboration implies that the process has to support dynamic routing and ad-hoc processes. I propose that allowing Social into a otherwise mostly rigid process causes more complexity than it is worth. Either you can define the process all-out, then go ahead and do your flowcharts. If you need to collaborate because the process is unpredictable then use a collaborative process environment. If that supports also rigid flows, even better. A collaborative umbrella is needed to link or get rid of the silos. But STOP! That does not discount at all Mike Fauscette’s perspective and the need he clearly describes for those enterprise applications to share an umbrella collaboration scheme! And that is exactly what I have been proposing for many years with the consolidation of work that goes beyond basic BPM, but requires more structure than email. A consolidated environment that supports all work processes, structured and unstructured, regulated and dynamic, in closed secure groups or open collaboration. No need to switch between ERP, ECM, CRM, and BPM apps. But also here the reluctance to admit that the silos are a waste is immense. The need to have all those silos and a collaboration layer ruins the simplicity of ONE umbrella. We now propose to leave it all AS-IS and put SOA on the bottom and Social on top? Really? Additionally, as soon as you need to support unstructured, collaborative knowledge work you need transparency and empowerment to succeed. We need to link to a Business Architecture for a clear definition of authority, goals, and means; we need well defined models for transparency into the silos by means of SOA or any other kind of exposed interface. Processes shouldn’t be designed but user-created and optimized by collaboration at runtime with goals and metrics. Collaborators aren’t tweeted with but rather invited into the process and assigned a delegated authority to view and act. Customers can be invited to participate and rate the quality of the outcome at the end. Management can monitor the embedded metrics and SLA rules can highlight the outliers. Can Activity Streams do any of that? I don’t see process optimization or learning there! Do you want to do insecure data mining on a massive store of tweets that also contain much of your business data in message format? Really? Even Social BPM is not adaptive and needs bureucracy to optimize. Do I discount the use of Social concepts? Not at all. My solution designs all include Social features including Natural Language rules and commands, but before they can be used sensibly, the process environment must move away from rigid flowcharts and into the collaborative umbrella. So yes, Mike Fauscette truly understands what businesses need, but whatever Activity Streams might be able to do at some time in the future, Adaptive Case Management does it already better today. I seriously promote anything that supports adaptiveness. Should Activity Streams really be accepted, they would indeed KILL BPM. I’d be ok with that too. Because ‘Social BPM’ is an oxymoron and nothing more than putting lipstick on a pig! ‹ Enterprise Architecture Master Data Process Content Relationship Management ? MIke, thanks for reading and replying. Much appreciated. I agree about stable begetting efficiency and unstable searching effectiveness. As you say nothing is really stable because this world exists as emerging structures in complex adaptive systems. We create stability for predictability and efficiency. That is clearly an essential part of industrialization. But let’s not forget that it is unnatural and creates a tension that eventually leads to a cataclysmic correction. Rigid processes in a rigid process bureucracy reduce the resilience of a business to changing conditions. ‘Social’ has a lot of power because it enables the dynamics of distributed structures. Like the two of us would never communicate without it. So it has its place, but then we don’t try to run a business. Structure does not have to mean rigid. Hierarchy is a must for efficiency AND effectiveness, but that does not have to mean flowcharts. That is my quest: To turn IT into a proactive enabler that empowers the executive to do things with his business that would be impossible any other way. To do that it must first empower each and every employee. I agreed with every word, including the fact that Michael Fauscette knows his stuff. So do you. 1. What is happens in your business every second, every day, occasionally, rarely? 2. What should be do about it? The answer can be built using business events to detect what happens and a combination of rules, process, and services to do something about it. The adapability comes from the tools you use. Mike., thanks for reading and commenting. I agree (re: confusing buzzwords) and I don’t. Yes, it will have to be the convergence of all these elements but not in the sense that they can remain seperate tools, because it will require huge projects to make them work and maintain them. Independently management of the tools doesn’t allow them to be adaptive. Activity Streams aren’t business events in my mind. Business events need to monitor much more than a few tweets. it might be the context of a tweet to a case that makes it a business event. It needs to evaluate data, content, process and people interactions and automatically detect those events that are relevant and enable people to act and react. Rules won’t do it. Rules are there to constrain and control and not to trigger singular actions to singular events. One can see Social on Top, process/case management in the middle and SOA on the bottom. Events are a combined state pattern of all three layers. So what happens must be discovered in that consolidated environment and be fully accessible to everyone. Only then the real-time aspect of current events with immediate responses without long analysis, modelling, simulation and implementation cycles can be achieved. The environments in use today fail miserably in all those respects. It will have to be a new consolidated system. It needs disruptive change! I couldn’t agree more that these should not be separate tools. Disruptive change is *always* needed. But, I believe that “social” is just a type of business event. Mike, thanks again. Two things on Social. First, it is about conversations. Which means it should not be seen as an unexpected event, but something that is normal in the progression of a business process. It can’t and shouldn’t be an outside event. it would have no meaning. Second, even if it seems to be a unique singular event it is not defined by the ‘type-of-event’ of a message coming in, but by the context of the message content, the sender, and the timing in relationship to the receiving context. The receiving context – if it can be identified – defines how the content of the message is to be interpreted into a meaning and therefore what it relates to in terms of needed activities. Without receiving context the message has no meaning and it is most probably irrelevant. That’s why I don’t see the social message itself as relevant but the total context of sender and receiver in a process management environment. Thanks for the link. I did not imply that Derek invented the phrase as such, but just that he applied it to Social BPM.